The family of LaShanda Anderson, a shoplifting suspect who was fatally shot by a Deptford Police officer last month, protest at the strip mall Sunday where the shooting occurred, demanding criminal charges against the police officer and disputing police accounts of the incident. The family of a North Philadelphia woman who was fatally shot by police in South Jersey last month is raising new questions about whether the use of force was justified, based on witnesses' accounts of the shooting. LaShanda Anderson, 36, of North Philadelphia, was fatally shot by police after she allegedly tried to hit officers with her car outside a Marshalls store in Deptford, authorities said. 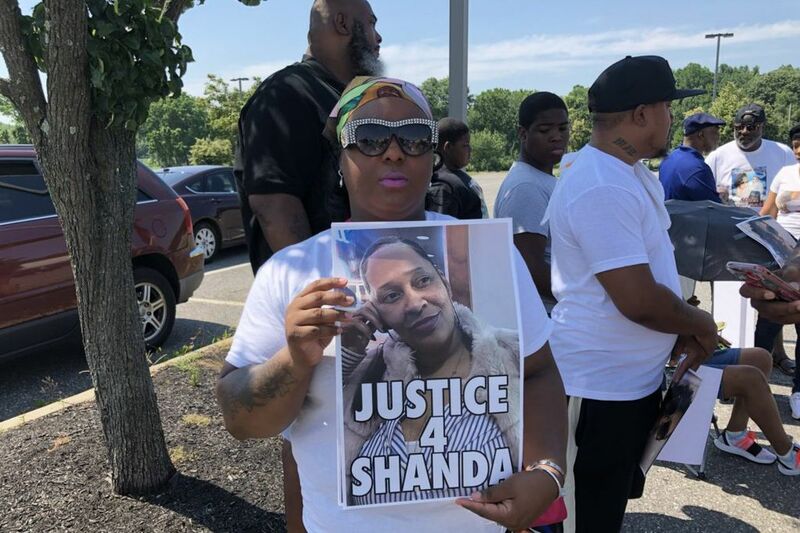 About 40 relatives and friends of LaShanda Anderson staged a two-hour protest Sunday in the sweltering heat in front of the Marshalls store at the Deptford Crossing strip mall where the shooting took place June 9. Anderson, 36, was shot twice by a Deptford Township police officer after she ignored a command to stop and tried to run over two officers, prosecutors have said. One of the officers, authorities said, fired in self-defense. Anderson was fleeing from what authorities have said was an attempt to shoplift more than $3,400 in merchandise from Marshalls with two accomplices. It is believed to be the first fatal police-involved shooting in Deptford. "Our purpose is to have her voice heard," said Anderson's niece, Traisha Way, 31, of Philadelphia. "We still have a lot of questions." Protesters wore T-shirts bearing Anderson's photograph and carried signs. In an interview with the Inquirer and Daily News, two people who said they witnessed the encounter disputed the accounts by police that Anderson had tried to run over one of the officers in a rented Nissan Armada. Kelly White, a friend of LaShanda Anderson’s, protests outside the Marshalls store in Deptford where Anderson was killed by police last month. "We saw her drive away and the cops chased them," said Olivia Scattergood, 19, of Clementon. "Their [the police] lives weren't in danger." Said her boyfriend, Aedan Bell, 22, also of Clementon: "They [the police] shot at the back of the car." The parking lot was full of cars and had a few pedestrians when the shots were fired, Bell said. The couple dropped to the ground, he said. The couple shared their story publicly for the first time Sunday. Both said they gave statements on Thursday to the Gloucester County Prosecutor's Office, which is investigating the shooting. In a statement, county Prosecutor Charles Fiore said Sunday that investigators are reviewing the case in line with guidelines from the state Attorney General's Office for officer-involved shootings. He declined to comment further. "To try this matter in the press is irresponsible and only causes further community division," Fiore said. The accounts of Scattergood and Bell could be crucial to investigators because Deptford, unlike a growing number of police departments, doesn't have dashboard or police body-camera equipment. "What I have heard here today is a grossly different account than the one told by the Deptford Police Department," said Terence Jones, who said he is a private investigator reviewing the case for the Gloucester County NAACP. "I just ask that they be transparent, because that's what this family deserves." Gloucester County authorities are probing an officer-involved fatal shooting outside this Deptford store June 9. Authorities say police Sgt. Kevin Clements fired three times at Anderson, striking her twice after she allegedly tried to flee from the Marshalls store where she and two others tried to steal $3,443 in merchandise stuffed into a suitcase. Family members said Anderson, a mother of three daughters, was shot once in the back of the head and once in the chest. She was pronounced dead at the scene. Chanel Barnes, 38, of Philadelphia, who was in the passenger seat, was arrested at the scene. Raoul Gadson, 43, also of Philadelphia, was captured several days later. All three had extensive criminal records. Clements, a 17-year veteran of the force, was placed on paid administrative leave pending during the investigation. A second officer who responded to the call was struck by the driver's side door of the fleeing SUV but was not injured, authorities said. Olivia Scattergood, 19, and Aedan Bell, 22, both of Clementon, say they witnessed the fatal shooting of LaShanda Anderson by a Deptford police officer. They dispute the police account that Anderson tried to run over an officer in an attempt to flee. Scattergood and Bell described a different scenario. The couple said they were placing purchases in their car when they heard a commotion — Gadson and a woman struggling with a store employee. Gadson fought off the employee, and the two women raced across the parking lot, where a police car had parked diagonally, trying to block their path, Bell said. The women ignored police commands to stop and dodged between parked cars and jumped into the SUV, he said. "As soon as they got in they took off," Bell said. "The two women drove away in the car and the police officer ran after them to fire the shots." "The car accelerated forward and it was in the opposite direction of where the police officers were standing. It wasn't facing their direction. It was facing away and they drove straight away. The cop on the driver side ran after them and then fired the shots. I guess when he realized he couldn't catch up to the car." The two police officers had responded to a report that a man and two women were shoplifting. A security guard in the store recognized one of the suspects from a state police bulletin about a retail theft ring targeting the Marshalls chain. Prosecutors said the officers were advised by a county dispatcher that one of the suspects was wanted in connection with an earlier manslaughter. But authorities later said that they had no information that any of them was wanted on such a charge. The local NAACP has called for the state Attorney General's Office to take over the investigation. The civil rights group said it plans to conduct its own probe, too. It has called for the Deptford Police Department to install dashboard cameras on its patrol cars and to provide officers with body cameras to offer more transparency when such episodes occur. Loretta Winters, president of the Gloucester County chapter of the NAACP, said she met with prosecutors recently and was reassured that a thorough probe would be conducted. "I want to see what comes out of this whole investigation," Winters said Sunday. "I want the prosecutors to do their job." At the strip mall Sunday, the protesters chanted, "Justice for Shanda!" and "All lives matter!" Some shoppers and motorists passing by the gathering offered support, while a few tried to drive through the crowd. "Regardless of her past, she didn't deserve to be killed," Way said. "She will not just be another hashtag." Anderson's criminal record dates to 2000, with cases in Philadelphia, Bucks, and Montgomery Counties. She has been in and out of prison after pleading guilty in cases ranging from retail theft and robbery to unlawful possession of a firearm and conspiracy to commit aggravated assault. She was released in 2017. Barnes and Gadson are facing charges in connection with the alleged shoplifting attempt. Barnes was released while awaiting trial; Gadson was awaiting extradition from Philadelphia.